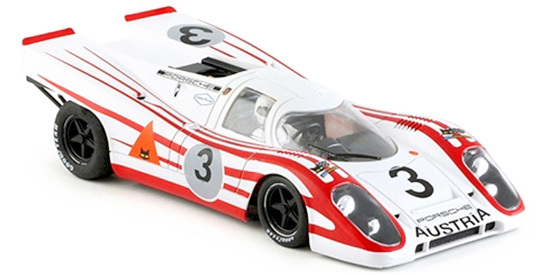 We located a few of these MRRC Porsche 910 and 911 racecars and they are on sale for the next week at a bargain price. 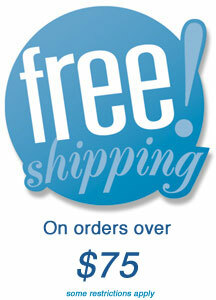 Limited to stock on hand. 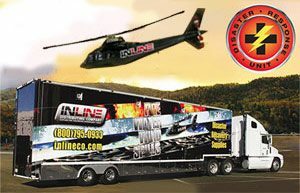 1/32 scale slot car, ready to run on all 1/32 scale non-digital tracks. Technical specification includes Sebring chassis (Inline configuration), Universal guide, SportFix braids, 21k rpm SlimLine motor, ClipFit chassis magnet (can be moved to 2 alternative positions or removed), detailed wheels and tires, fully detailed body and interior including painted driver figure. A basic 911 as raced in countless SCCA amateur races and the U2.5 division of the TransAm in many different liveries. 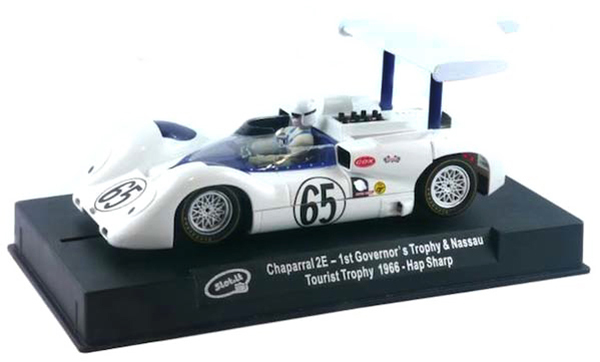 The first Slot.it Chaparral 2E in several years is available now in limited quantities so order yours while they last. 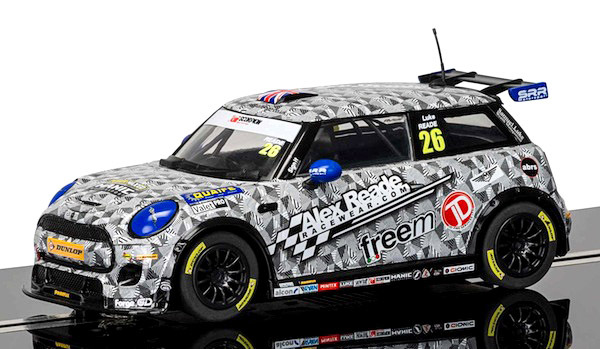 Nine new Scalextric racecars are here now, including the incredible Rum Bum Audi and the first two bargain-priced GT Lightning cars in Anime carton markings. Scalextric C3837 Team GT Lightning – Team GT Sunset (Anime) high-impact crash resistant generic modern GT car. Scalextric C3838 Team GT Lightning – Team GT Sunrise (Anime) high-impact crash resistant generic modern GT car. The McLaren P1 is a limited production plug-in hybrid sports car by British manufacturer McLaren Automotive. The concept car debuted at the 2012 Paris Motor Show. Deliveries to retail customers began in the UK in October 2013. The entire P1 production of 375 units was sold out by November 2013. The production run ended in December 2015. It is considered to be the long-awaited successor to the McLaren F1, utilizing hybrid power and Formula 1 technology. It does not have the same three seat layout as its predecessor. The design of the headlights is very similar to the shape of the McLaren logo. Just like the McLaren F1 road car of 1992, the McLaren P1 is a mid-engine, rear-wheel drive design that uses a carbon fibre monocoque and roof structure safety cage concept called MonoCage, which is a development of the MonoCell used in the current MP4-12C and MP4-12C Spider upgrade that came out in early 2012. The 2013 Total 24 Hours of Spa was the 65th running of the 24 Hours of Spa. It was also the fourth round of the 2013 Blancpain Endurance Series season. Von Ryan Racing were running the Mclaren 12C and after qualifying 28th Chris Goodwin, Rob Barff and Bruno Senna had a tough race ahead but managed to finish in 15th. Scalextric C3851 Porsche 911 RSR, Falken Tire Marking the one year anniversary of the debut of Valentina, the team’s 991 generation 911 RSR, Falken where looking confidently forward to returning to Sebring. They showed strong running at Daytona until an engine failure forced retirement. During the race over 5 hours was spent under caution but the Porsche driven by Wolf Henzler, Bryan Sellers and Patrick Long managed to keep out of trouble and finish in 12th overall and 3rd in there GTLM Class. The 2013 Rolex Sports Car Series season was the fourteenth and final season of the Grand American Road Racing Association’s premier series, before merging up with the American Le Mans Series in 2014. 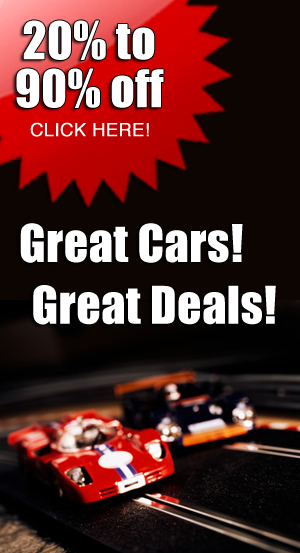 It began on January 26, with the 51st running of the 24 Hours of Daytona. Rum Bum Racing entered the event this year running an Audi R8, after a disappointing Qualifying they would start the race in 32nd position, however they managed to stay clear of danger during the gruelling race finishing 15th overall and 7th in the class. Rob Collard has become a house hold name in the BTCC now with over 400 race starts to his name. Rounds 7, 8 and 9 took Place at the high speed Thruxton circuit, with extremely high temperatures being experienced at the circuit, round 7 was full of incident and a huge amount of punctures towards the end of the race eventually resulting in a multi car crash causing a red flag. Collard would finish 5th. The next 2 races were reduced in distance as a result and Collard would go on to finish 2nd and 6th in the next 2 races. The first 3 rounds of the BTCC season took place at Brands Hatch. It turned out to be a very good weekend for Aron Smith and team BKR. Smith Qualified 10th and went on to finish the races in 7th, 3rd and 8th. Luke Reade races in the F56 class in Mini Challenge, Donington Park was where the action was taking place on the 23/24 April 2016. Unfortunately, Luke was unable to take place in the first race due to technical issues, but his teams mechanics worked hard to get him out for race 2 where he finished 15th out of 29 runners. The latest Carrera DTM AMG Mercedes C-Coupe Digital 132 is here. A real eye-catcher. Lots has changed with the look of the car since BWT, Europe’s no.1 provider of water technologies, signed up as a sponsor. The DTM family Mercedes C-Coupe with its eye-catching livery makes the most internationally popular touring car race series an even more colourful event. It guarantees excitement and thrills among racing fans with a 500PS/493.16 hp V8 induction engine. 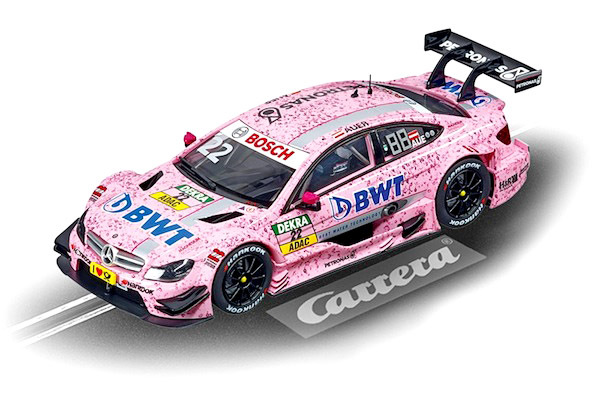 In 2015 racing driver Lucas Auer drove this model in the ART Grand Prix with the no.22 on the side 22, after having joined the DTM series at the beginning of the season. The Carrera DIGITAL 132 AMG Mercedes C-Coupe DTM “L.Auer, No.22” slotcar is a faithful reproduction of the original. 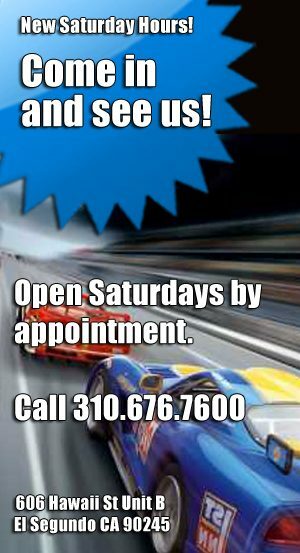 This Carrera car can be individually coded, is digitally controllable and guarantees authentic racing thrills. 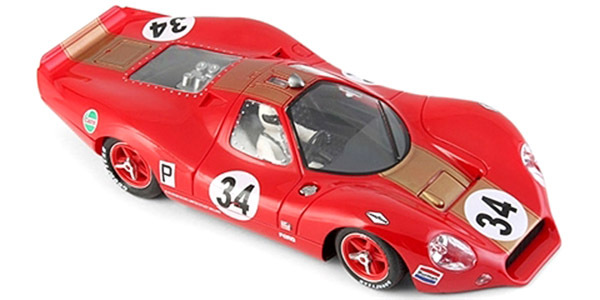 Sideways replica of the IMSA Mustang in the correct red markings is available now. Racer (Sideways) SW46M Mustang Turbo – Bill Scoot Racing – IMSA GTX – Mid Ohio 1981. ‘It’s Miller Time’, driver Klaus Ludwig. The new Sideways Monster Energy pit personnel is here. SWFIG-015 Monster Energy Umbrella Girl. Two new cars are coming from NSR in the most popular liveries ever. You can pre-order yours now. NSR NSR0034SW Ford P68 (F3L), #38 Brands Hatch 1968—PRE-ORDER NOW! NSR 1/32 Analog RTR BMW Z4 “Gulf” Livery #025 Limited Edition – Adjustable front axle ride height – Drop Arm type Guide Flag with Screw to Allow Fixed Position – Setscrew Aluminum wheels all around – Anglewinder Balanced King Motor 21,400 RPM & 350 g-cm Torque – Adjustable suspension motor pod – Heat treated axles – Machined bronze self lubricating bushings – Ultra smooth and quiet all metal gearing – Adjustable suspension motor pod – Clear Coat Finish for maximum durability and high gloss – Includes the EVO Chassis that will accept Inline / Anglewinder and Sidewinder Triangular motor pods. NSR NSR0036SW Porsche 917K #3 Daytona 24 Hours 1970—PRE-ORDER NOW! NSR 1/32 Analog RTR Porsche 917K #3 Daytona 24 Hours 1970 – EVO Chassis with adjustable front axle ride height – 20,000 RPM Shark Motor Sidewinder – Lightweight drilled aluminum setscrew wheels front & back – Ultra smooth and quiet all metal gearing – Heat treated axles with self lubricating bushings – Neodymium traction magnet – Clear coat finish over paint and Tampo printing for maximum durability and high gloss.